Emlyn Lamar Stewardson was born in 1863 in Philadelphia, the son of Thomas and Margaret Haines Stewardson and the younger brother of architect John Stewardson. 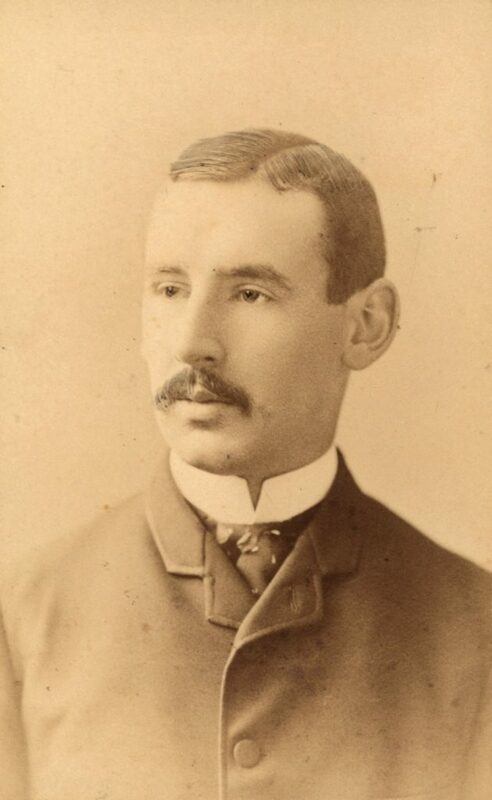 After being educated at Germantown Academy and St. Paul’s School in New Hampshire, Emlyn Stewardson attended the University of Pennsylvania, graduating in 1884 with a degree in civil engineering. He worked for a few years as an engineer for a structural engineering capacity before joining his brother’s architectural firm, Cope & Stewardson, in 1887. At first the younger Stewardson handled contracts and engineering for the firm. After his brother’s sudden death in 1896, Emlyn Stewardson became Walter Cope‘s partner, handling business and engineering matters while Cope focused on design. After Cope’s death in 1902, Stewardson continued the firm name as Cope & Stewardson until 1912, when he took on a new design partner, George B. Page, and changed the office name to Stewardson & Page. As a partner in Stewardson & Page he contributed to the building of Bennett Hall (1925) in the collegiate style.